The Beerhunter: Schwarzbier, that German-style black lager, returns! The Beerhunter: Schwarzbier, that German-style black lager, returns! Home » Articles » The Beerhunter: Schwarzbier, that German-style black lager, returns! Schwartzbier is black as night, but light as a feather. Close your eyes, and you'd never know you were drinking a dark beer. Now that the colder months have blown in, bar managers across the Valley are pulling IPAs, pale ales, and pilsners from their tap handles to make room for some thicker, darker brews like stouts, porters, and barrel-aged specials. Seasonal variety is all well and good, but I’m not always in the mood for a beer that eats like a meal. Most winter beer styles are as filling and thick as those hazy, juicy New England IPAs we can’t stop buying during the summer. Is there any room on the winter menu for a beer that manages, somehow, to be both dark and refreshing? Schwartzbier is black as night, but light as a feather. Close your eyes, and you’d never know you were drinking a dark beer. One terrific solution, as you might guess, comes from our crafty friends in Germany, where lager breweries turn out light-bodied options for the chilly months alongside malty märzens and decadent doppelbocks. One of the best is schwarzbier, a black lager that gets its darkness from its malt roast but skips nearly all of the density. 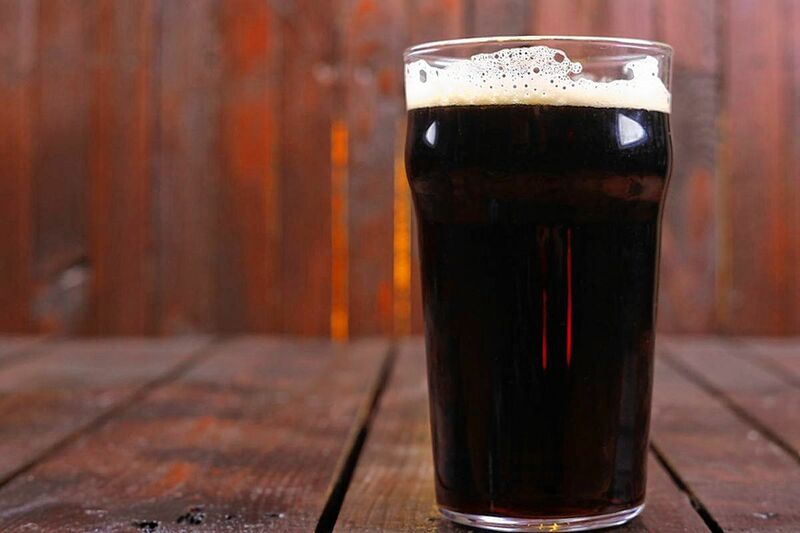 And despite being very dark brown or near-black in color, the flavor of a schwarzbier is light and mild, not thick or bitter. Schwarzbiers, like many lagers, are on the rise in American craft beer. Several regional companies like Sam Adams and Brooklyn Brewery make a black lager, as do semi-local breweries like Jack’s Abby in Framingham and Suarez Family Brewery in Hudson, N.Y. Closer by, Element Brewing Company in Millers Falls has put its own spin on the style with Dark Element, a black ale that combines the malt profile of a schwarzbier with the floral characteristics of an IPA. But locally-made examples of traditional schwarzbier are fairly rare. So it was a bit of a novelty to see a schwarzbier win first place in the annual Pioneer Valley Homebrew Competition in October. That beer is by Alden Burgess, a Florence resident who has been homebrewing for about three and a half years. 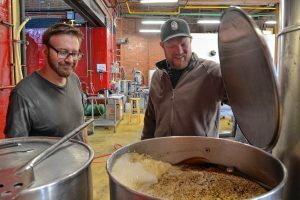 His 5.25 percent ABV schwarzbier triumphed over 35 other entries, winning him $250 in charitable funds that he donated to The Food Bank of Western Massachusetts. In addition, New City Brewing in Easthampton — which co-sponsored the competition alongside Beerology in Northampton — is brewing a two-barrel batch of Alden’s recipe, to be served at its taproom on Pleasant Street starting this week. Burgess tends to drink IPAs and stouts, although he says he likes to make ‘sessionable’ beers with low ABV because “I’ve got two young kids, and I want to be able to wake up the next morning.” But he’s been brewing more lager than ale recently, and he says he’s always liked the schwarzbier style. Nearby, at Northampton Brewery, head brewer Donald Pacher has also recently put his schwarzbier on tap. Pacher has been brewing his black lager, called Conundrum, twice a year for a while. The name has held up because most visitors to the brewery are still somewhat baffled by a beer that looks this dark but tastes this light. “Drink it with your eyes closed,” says Pacher. “It’s a gentle lager that happens to be dark.” Conundrum is one of his favorite recipes, he adds, because it’s so fun to offer to people who have never tried a schwarzbier — which is to say, most people. Chris Sellers is one of those special guests. 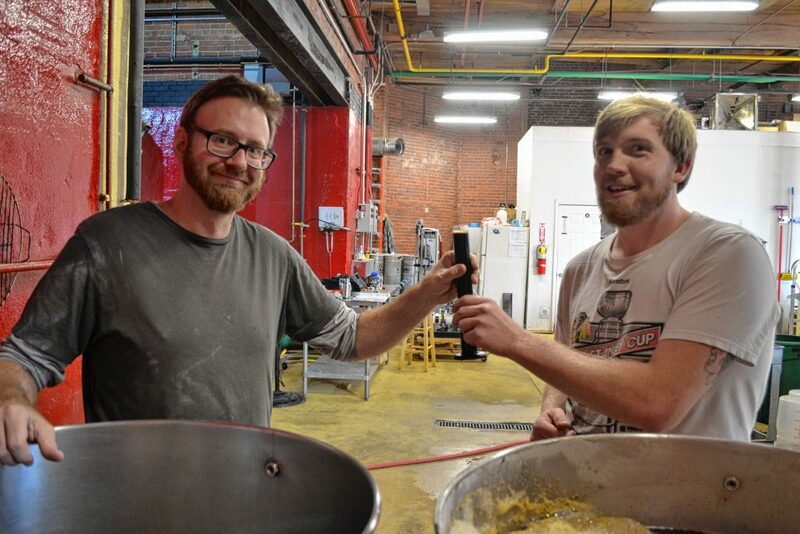 As the brewery manager at The People’s Pint in Greenfield, he and Pacher have made several black IPAs together, and Sellers is planning to release a schwarzbier at the Pint in the late winter or early spring. Sellers and his team at the Pint brew their Oktoberfest for almost three months, and their Pilsner takes almost two months. “I think in this current world of fast turnaround, hazy, hoppy beers — which we brew and I enjoy making just as much, for different reasons — I really enjoy the long, slow, precise process of brewing lager,” he says.